Integrations allows you to add and manage custom links as well as application integrations that are external to the Transportation Data Server application. Integrations can be embedded or added as links that displays on App Manager's home page. Click + Add New to open the new Integration form. Note: To view examples of popular integrations, such as ArcGIS Map and Google Street View, click Examples in the top right corner and select the integration you would like. Enter a name for the link or integration in the Name field. Enter the URL for your external link or integration in the URL field. Enter a description for the link or integration in the Description field. Check the box beside Make integration embeddable within the page to make the integration embedded within the application. 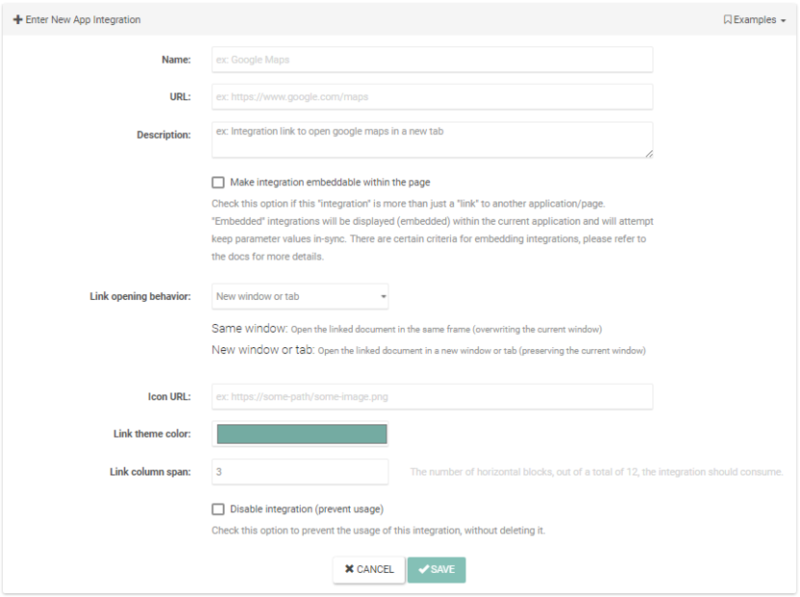 If unchecked, the integration will be a click-able external link. Note: If no Icon URL is added, the link will display the link theme color selected below. Enter the number of horizontal blocks (1-12) you wish the link or integration to take up across the display in the Link Column span field. You can disable the link or integration by checking the Disable integration (prevent usage) checkbox. Click the up or down arrow in the Actions column of the integration you want to reorder. Click the pencil icon in the Action column of the integration you want to update. Make the needed updates in the form. Click the angled arrow icon in the Action column of the link or integration you want to test. The integration should open in a separate browser window. Click the trashcan icon in the Action column of the link or integration you want to delete. Click Delete in the Delete Integration popup.